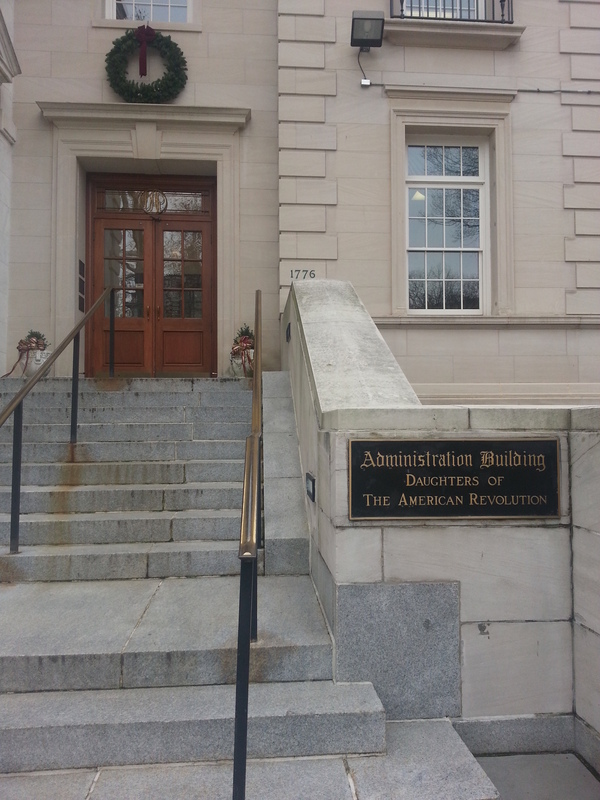 Recently, in Washington, DC, I had an opportunity to spend a day at the Library of the Daughters of the American Revolution. 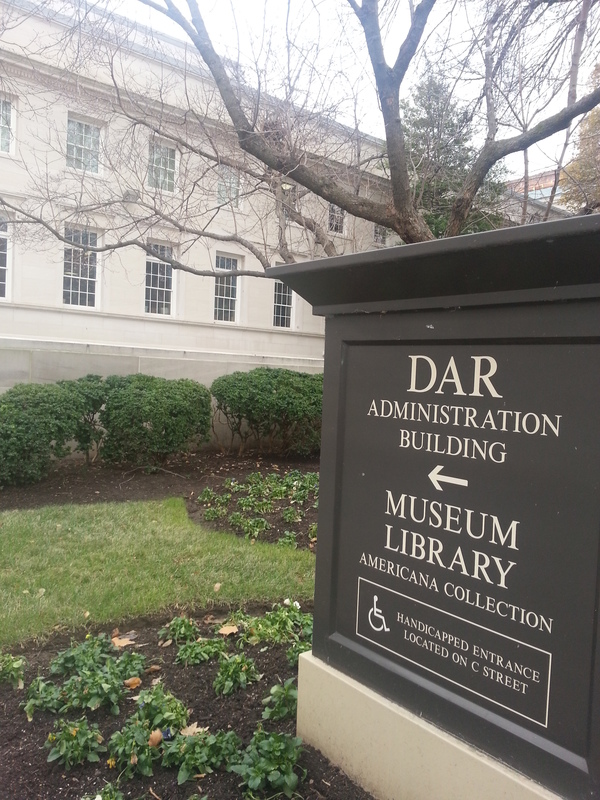 The library is located with the DAR Headquarters at 1776 D Street NW, very close to the White House. 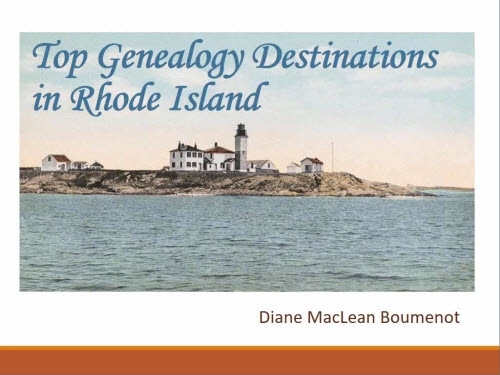 I am not a member, but had heard this was one of the great genealogy libraries. For convenience, I took a cab over, but I walked the six blocks to the Metro when I left. consulted a book I had picked up in a bargain bin, The Center: A Guide to Genealogical Research in the National Capital Area by Christina K. Schaefer (Genealogical Publishing Company, 1996). While a little bit out of date, it made some good points. Looked over the genealogy guide on the DAR website. Read about the library and resources on the DAR website. the RESOURCES search page includes the Revolutionary Pension Card Index and DAR Analytical Card Index and the Forgotten Patriots Research Guides. looking at various records in the well-known GRC reports, which contain the work of many, many DAR member over the years who compiled local public and private records. These are often unique and not easily available elsewhere. Looking at books on locations and family names. The Library is housed with DAR Headquarters, Museum, and Constitution Hall. At the entrance, I went through a security check and explained that I was going to the library. The inside of the Administration building is interesting, although I skipped the historic rooms and displays. It was decorated for the holidays, and lots of members turned out as the day went on for what was, I believe, an event that evening. 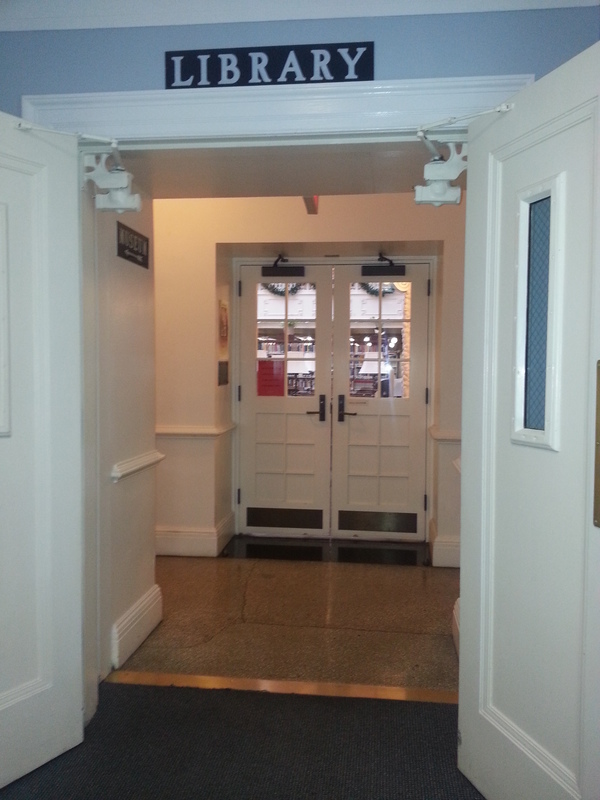 The entrance leads you into the security area for the building. 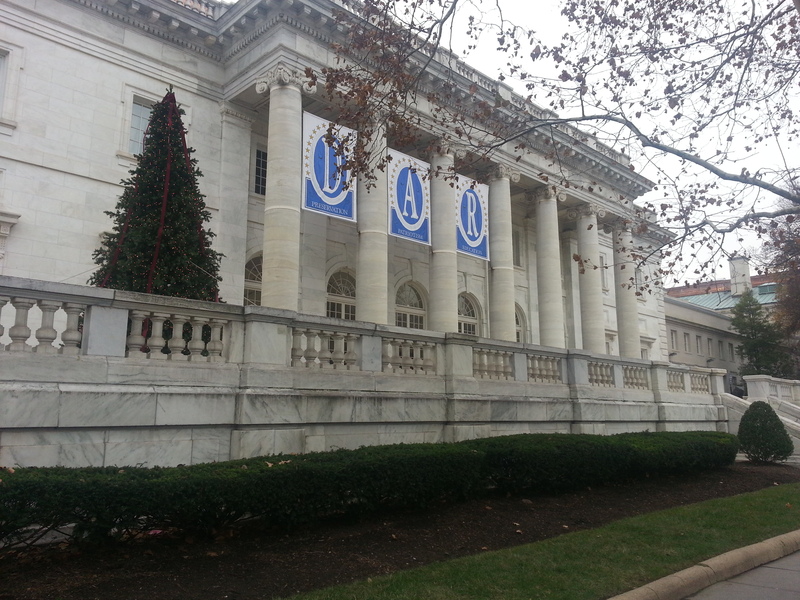 I found the entrance for the library and once inside, paid $6.00 for a full day’s nonmember admission. I also paid $15 for a camera pass so that I could record the book pages I found, which is my usual procedure. I don’t begrudge research facilities these charges; any repository you go to has operating and collections costs which far, far outweigh the fees collected. Once you go through the security area, you can enter the library. I had told my friend Barbara Poole of the Life From the Roots blog that I would be visiting; she lives in New England now but formerly worked at the DAR Headquarters. She introduced me, by email, to the Director of the library, Eric G. Grundset. I met Mr. Grundset during my visit and we had a nice chat. He is working on an interesting project, and once it’s done I’ll be passing that info on to readers here. 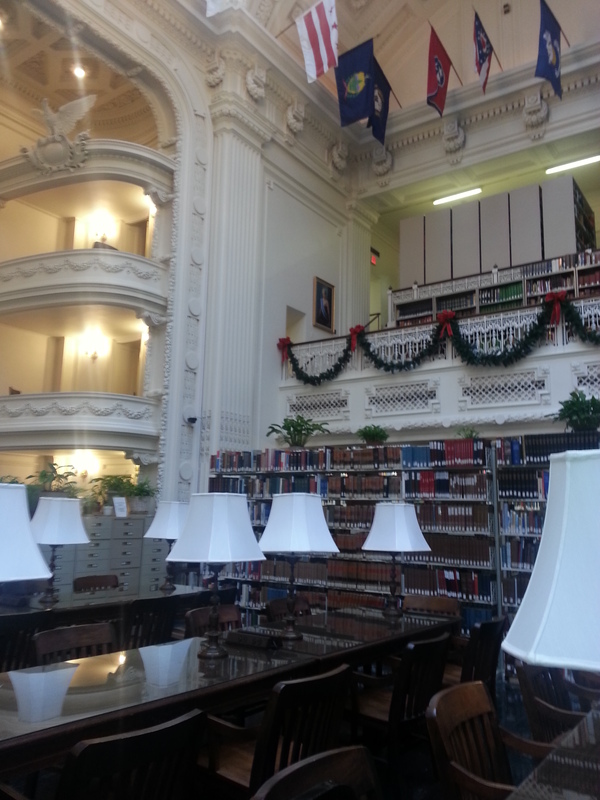 The library is a grand and lovely setting for research. The library reading room itself is spectacular. Gorgeous and stately, it’s like being inside a wedding cake. I thoroughly enjoyed it, and my pictures do not do it justice. I perused the book stacks for some items I had seen in the catalog from home. I pulled some books and went through them, and took some photographs. It cost $6 for a full day admittance (for non-members). Next, I talked to the librarian about the GRC (Genealogical Records Committee) books that I had searched for from home. 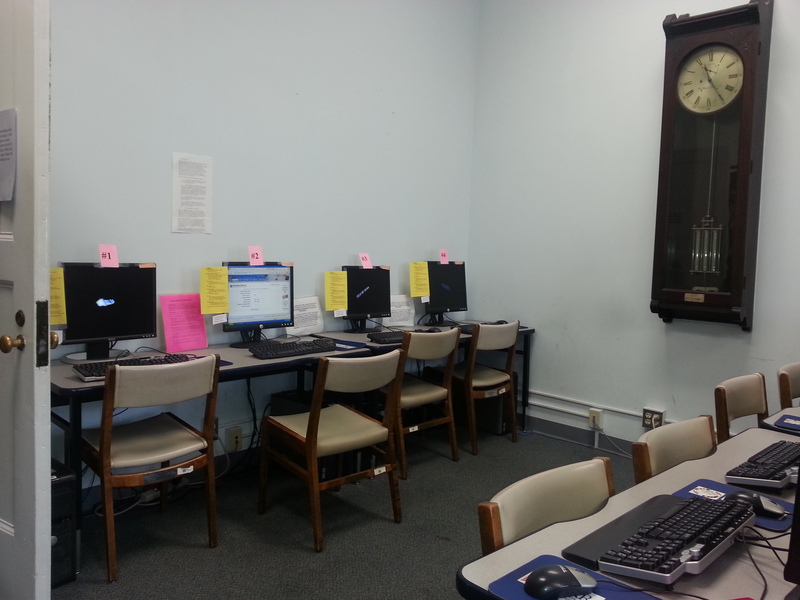 In the library, those tend not to be available onsite anymore, but have been indexed and scanned and are available in the Seimes Technology Center. I headed there, searched for some GRC items and, when I found them, was able to click through to the actual pages and look at them. This would not be available from home. The Seimes Technology Center offers access to membership applications and various databases. In the Seimes Technology Center, I also looked up numerous ancestors to see if anyone had ever submitted an application for them as a Patriot. I was interested to see the sources that were given and also to look at the descendants as evidence for some marriages. There were four or five, and some unsuccessful searches. One, in particular, on the Darling side, I plan to look into further. Most of the rest I was pretty familiar with, particularly from my visit to the Sons of the American Revolution Library in Louisville, KY. I spent time at a study table photographing pages from books. A camera pass, to do this, cost me $15. Back in the reading room, I looked through a variety of county records and came across a huge collection of Maryland County land and church record indices. I thought these could be very helpful for my questions about my Loyalist ancestor James Anderson. Unbeknownst to the Daughters, and with silent apologies to them, I spent the last hour or two researching Loyalist James Anderson, who owned property near Fort Cumberland, Maryland in the mid to late 1770’s. No luck, but I was happy I had the chance to try. The book stacks are extensive. I loved my opportunity to get to know the library. Now that I am more familiar with it, I think, if I ever have another visit, I will look into the DAR Analytical Card Index a bit more, which serves as an index to many materials in the library, and plan to research using some manuscripts. There would be much, much more to do at the library, many more questions to ask, and many more collections to explore. Photos by Diane Boumenot. 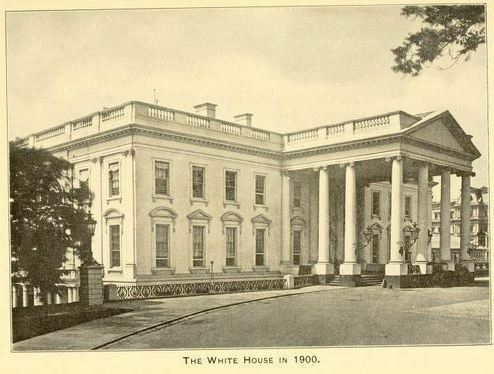 White House illustration from The Presidents from 1776 to 1900 and the History of the White House (New York Life Insurance Company, 1900), p. 57 (unnumbered). 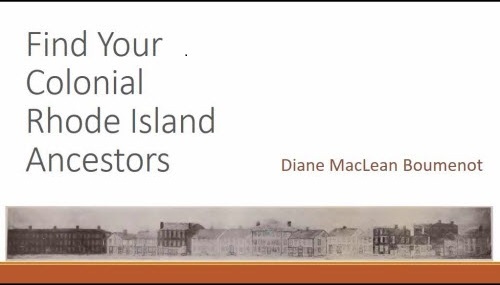 Hi Diane, very interesting and informative article. I am a member of DAR but have never visited the library. Maybe someday! This is my first visit to your blog — looks great! Thanks for the visit and the kind words, Lois! Quite a nice library, I think you would enjoy it. Wow! What a fantastic looking place. It just looks gorgeous. Thank you for taking so many photos. Great post. I am a member of DAR from Illinois and am so pleased you enjoyed the facility. Perhaps you may be interested in join the DAR now. 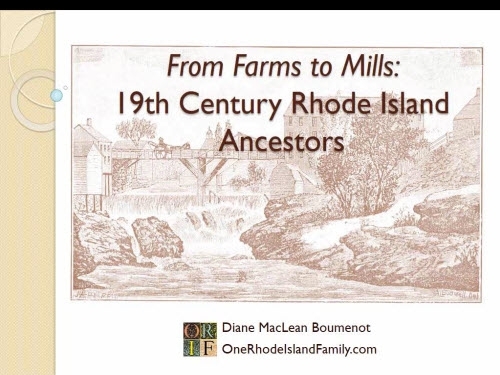 Many of my people were from RI, MA, PA, NJ and other points. Thanks Gloria! Always nice to be invited. I hope the readers take an interest, too. This is one place I’ve always wanted to visit. Thanks for all the great advice for first timers. Heather, I think you would really like it. Hope I get to go back someday, too. Such a good article Diane. A perfect post to share with others who are planning to go there. Thanks for bringing back some memories to me. I’m glad you had a good time and were able to work the visit into your schedule. Barb, I knew those pictures would bring back some memories for you. It’s quite a lovely place. Nice post Diane! 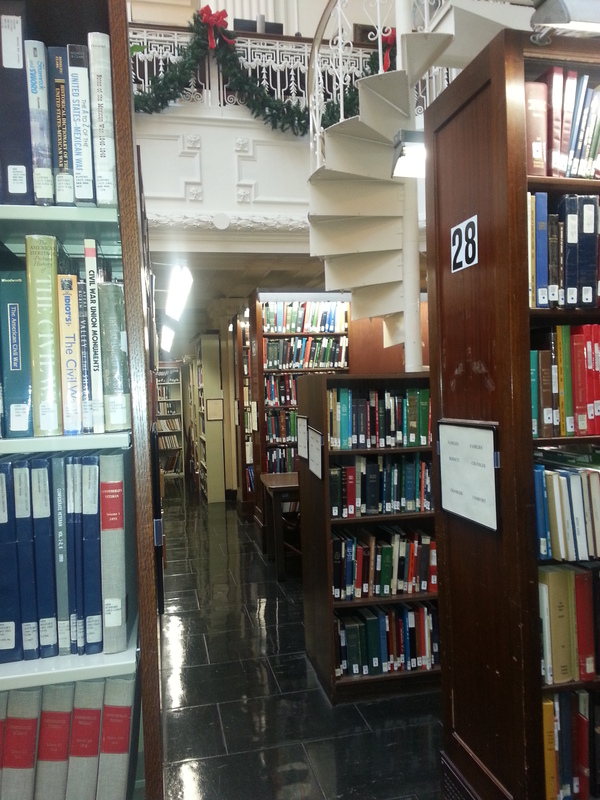 I live about 50 miles from DC and the DAR Library and have used it a handful of times. 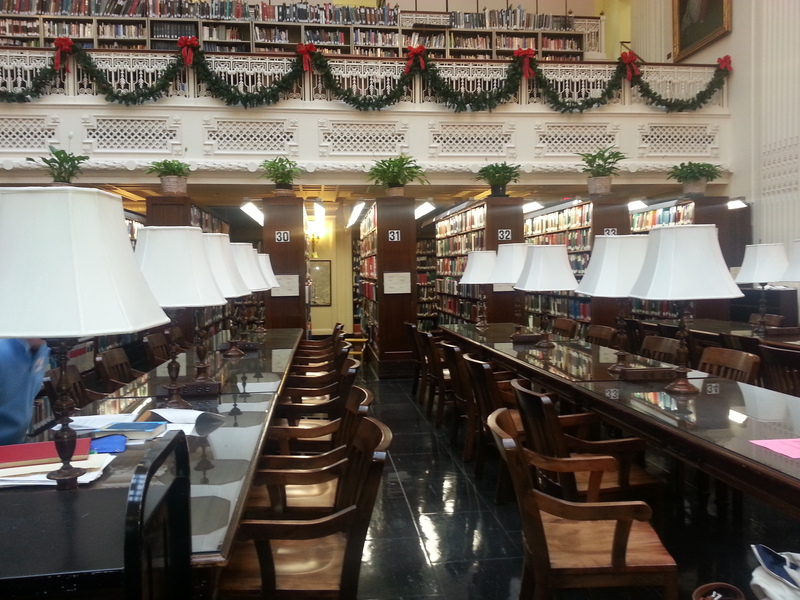 I am a SAR member which gives me reciprocal rights and privileges at the DAR Library. I work at the Washington Navy Yard, which is only a few Metro stops from DAR, but I have only gone there from work once. I am probably due for a visit there, so if there is something you wanted to copy but were unable — let me know. I hope to get there after the New Year. Thanks, John. 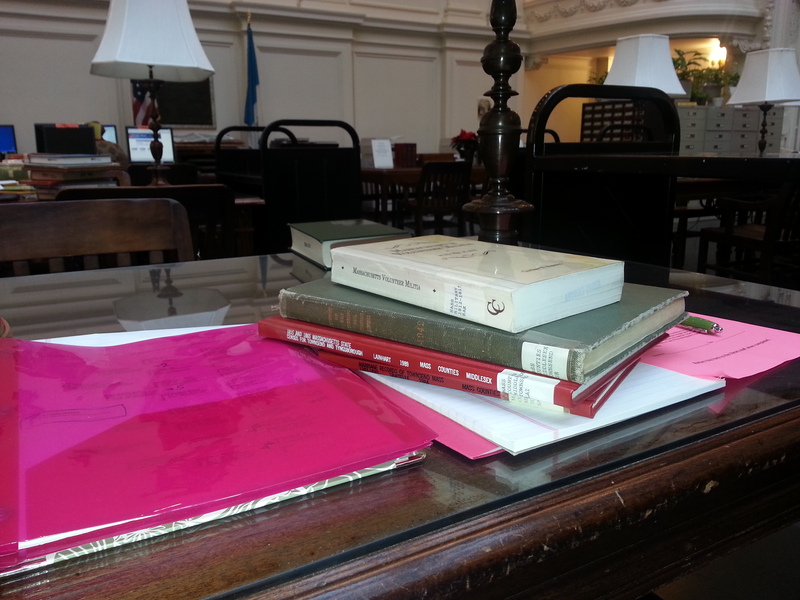 Since I am the kind of person who needs to see things, in person, I’m starting to have a much better handle on what’s available at the DAR Library, and I may take you up on that.